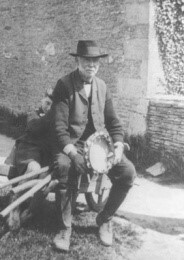 Badby has become famous in Morris dancing circles because of one man – Cecil Sharp who, often accompanied by his friend, George Butterworth, visited villages in many parts of England and America to collect in writing as many old country tunes and dances as possible. 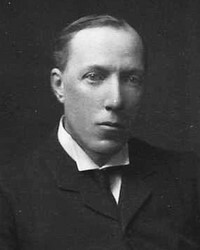 Born in 1859 in London and a scholar of music, Cecil Sharp was concerned that English musical life was being dominated by German influences. He wanted to discover purely English sources of music. In the early 20th century he was excited to witness the Headington Quarry Dancers performing on Boxing Day. They apologised for dancing ‘out of season’ as they needed to earn extra money. 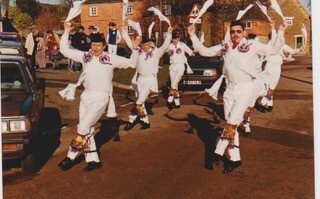 Sharp was told that it was usual for Morris dancing to be performed in the early summer in the South Midlands. He enquired further and was sad to discover that in many places, traditional country dances were no longer being performed. Customs, which had reached back, possibly into pre-Christian times, were dying out, even in rural communities. In 1910 Sharp and his friend George Butterworth visited Badby while they were staying in Fawsley. They met one of the last of the old local Morris dancers, Ephraim Cox, who was living in Badby at the age of 71. He told Mr Sharp that the dances were discontinued about forty years previously, but he could remember the steps and tunes of three dances and the names of about nine others but unless he could remember the tunes he could not recall the steps of the dances. Two others – Mr Ashby and Mr Cole added further details which were noted down and details are preserved by The Folkdance and Song Society at Cecil Sharp House in London. The photograph on the right shows James Locke, a Badby Morris Dancer. "In the afternoon, Florence, Harry Knightley and I motored to Stratford to see some Morris dancing by children from Glastonbury, one of a series of similar entertainments which have been alternating with the Shakespeare plays during the three weeks’ summer season. The dances were extremely pretty, with the Avon, with boats and swans for a background and I was interested to make acquaintance with Mr Cecil Sharp who told me he had picked up a tune called Headdon Fawsley, and wanted information about it. I must enquire." Ephraim Cox described the uniform as white pleated shirts with epaulettes and rosettes attached, two white silk scarves crossed, ‘Scotch’ caps with ribands and white trousers. The sticks they used were rather larger and stouter than usual and a full inch in diameter. Two of the first three dances Sharp recorded – Shepherds’ Hey and Beauxs of London City - are stick dances and the third is Old Black Joe. These were published by Sharp in 1913 in Volume Five of The Morris Book. Badby dances also remembered are First Morris, Second Morris, Balance the Straw (another stick dance), Broad Cupid, Cuckoo’s Nest, Flowers of Edinburgh, Saturday Night, Trunkles and Bobbing Joe (all now online). Details of these tunes were kept by Butterworth in his manuscripts but were unpublished at first because he was killed in the Battle of the Somme. The Nene Valley Morris of 1905 led by the Revd. Walter Watkins-Pitchford, vicar of Lamport, continued some of the Badby dances and now the Moulton Morris Men are the custodians of the old Badby tradition as there is now no team in Badby. Barry Care, who has danced with the Moulton Morris Men, was kind enough to give us this further information about the dancers’ uniform and Jacqueline Wojtecki has made a model dancer using his description. He writes: "We know the costume of the Badby team was as follows :- white trousers, white pleated front shirts with epaulettes on each shoulder. Through the epaulettes were threaded white silk scarves crossed over at front and back and knotted on each hip. On the front and rear of the shirt at breast height they wore rosettes, one each side and coloured red, white and blue. Hats were ‘scotch’ type decorated with ribbons, presumably red, white and blue again, as were the jingles on their legs. Several of the cavalry regiments stationed at Weedon Barracks wore what we refer to as ’scotch caps’. Most likely they were fairly easily obtained in the area. Years ago we danced out in Badby type kit in Badby each year." Badby resident, Alice Teulon and a friend kindly recorded them for the exhibition. To hear these recordings, play the audio below. Sorry - your browser does not support the audio element. 1851 Aged 12, he is an agricultural Labourer living with his mother who is a pauper He has a sister, Sarah who is 10 and a brother Eli who is 7. They live in cottage 22 (see Note 1) on the census and their neighbour is Edwin Fennell. 1861 He is still described as an agricultural labourer and was living with his brother Eli. There are no further references to his mother. 1871 He is aged 32 and still an agricultural labourer. He has a wife, Mary Ann Fennell and 6 children are present. They live in cottage 113 on the census. The Fennells live next door still. 1881 The situation remains the same when he is 42. Five children are mentioned. Their neighbours are William Sutton, a butcher, on one side and Ann Fennell on the other. 1891 He is 52 and now his son Ephraim is living next door. 1901 At the age of 62, he is now described as a farmer and has different neighbours. His son Ephraim was a gamekeeper and gas stoker. 1911 He is 72 and back to an agricultural labourer sharing his 3-roomed cottage with Mary Ann. His son Ephraim is living at the Post Office. Notes: 1. Cottages are numbered in the census, but not given street positions and numbers vary between census years. 2. There were several people in Badby around this time named Ephraim Cox. One died as a child. There are two graves in Badby cemetery with this name, but neither of them match this record. One appears to be Ephraim Cox junior mentioned above, but the other man died at an earlier age. 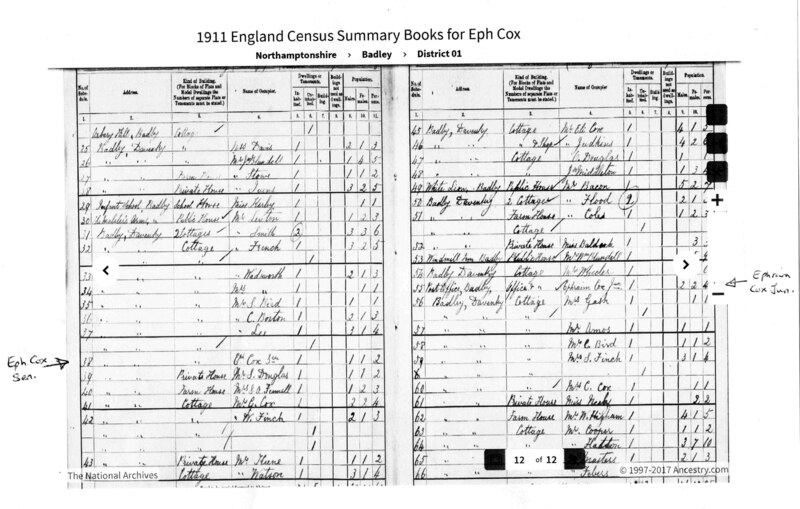 An E. Cox also appears on the 1911 census (see below). Research will continue!